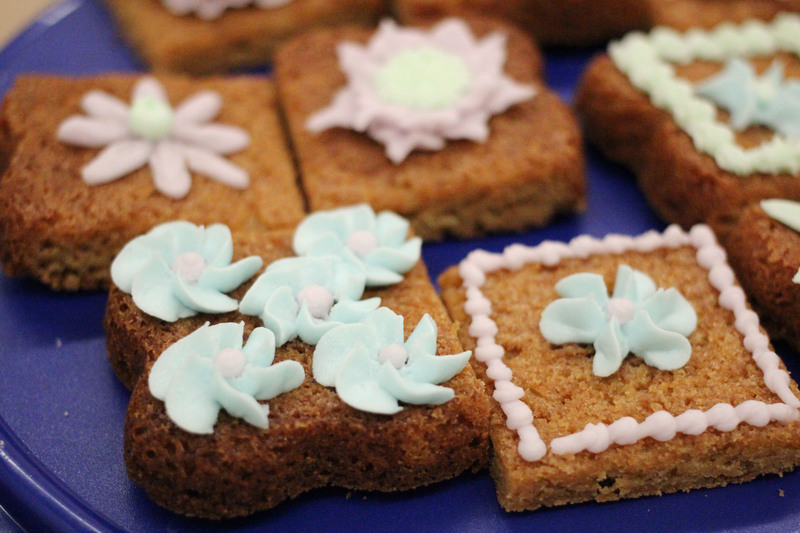 Wilton Cake Decorating Course Update III: Flowers & Borders – amandarobots. For that reason, we were allowed to bring in pretty much whatever treats we wanted, so long as they had about 3 inches of decorating surface. I chose butterscotch brownies, because yum. For borders, we learned bead borders and shell borders, which essentially use the same technique, but with different tips. We also learned the so-called easy ruffle, which is not easy at all because it requires you to move your hand across your surface while simultaneously wiggling the tip up and down to create the ruffle. Yeah, not easy at all to get all that movement going at once. Then there’s grass, which has its own unique tip. I didn’t actually put any on my brownies because a random patch of grass covering a brownie is not all that cute. (Some people in my class did it, and I wasn’t fond.) I can see how the grass tip would be useful, though; the instructor mentioned that it makes good fur on a Sesame Street cupcake. After grass came leaves, which also has its own tip. They’re quite easy, although they tend to get a little crumbly at the ends (perhaps my icing was too dry?) and I struggle to keep mine of uniform size. This tip also makes petals on the sunflower. Next we moved on to flowers, the most basic of which only involve one tip. You can see drop flowers and drop swirl flowers in the above photo; the only difference between the two is with the drop swirl, you rotate your hand while piping the icing. 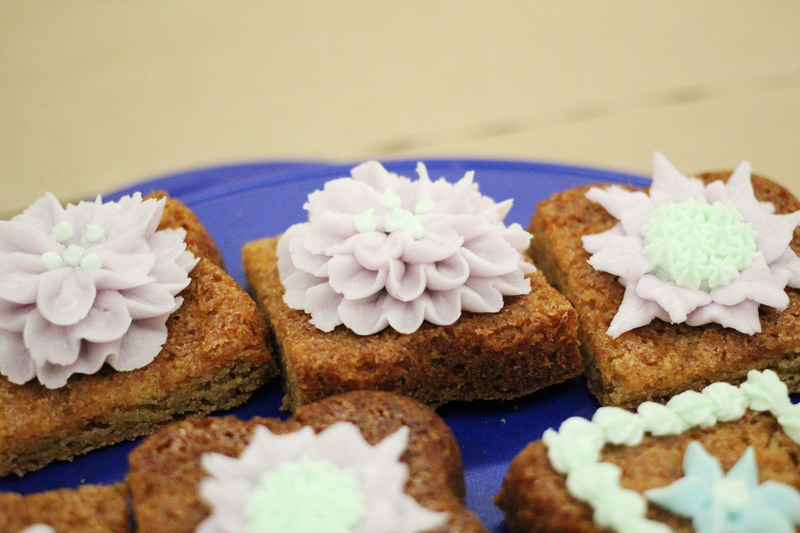 A dollop of icing in the middle (or an edible bead-sprinkle thing) makes the flower centre. Then things got more complicated. The sunflower is not my favourite flower (and doesn’t look much like a sunflower unless you do it in sunflower colours). It involves piping a big dot of icing in the centre, then surrounding it with two stacked and offset rows of “leaves” for petals. A star-filled centre is supposed to recreate the texture of a sunflower middle. Not easy, and mine definitely need more practice! My daisy sucked, too, although I attribute that largely to Wilton’s instruction to place the thin edge of the tip facing you. 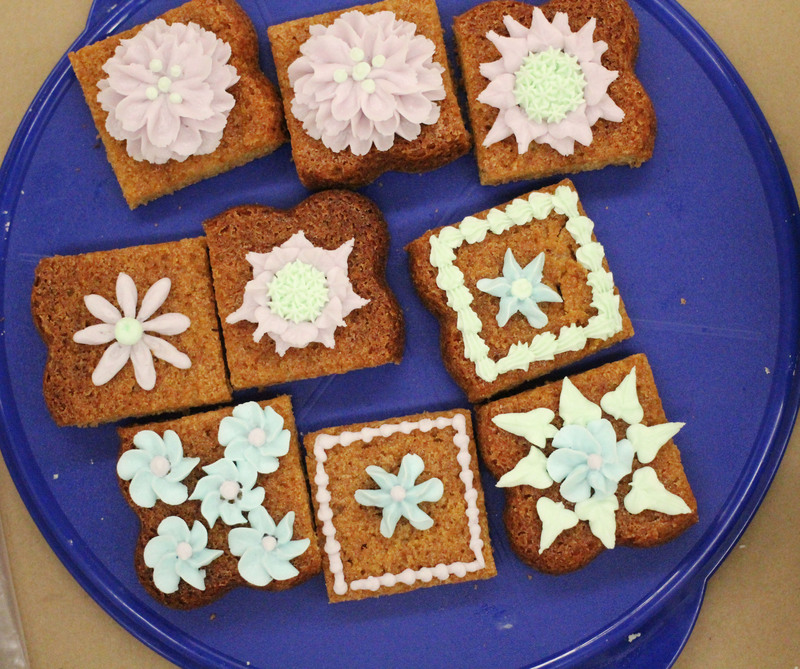 The instructor also showed an alternate way that results in more rounded, tidy petals, and that’s what I did on my brownie (middle row, far left). Finally, in the last twenty minutes of class we got to the most impressive-looking flower: the zinnia. For this, you place a big dot of icing in the centre. Then, using the same tip as the easy ruffle, pipe a circle of tight ruffles around. To do this, you have to rotate the treat at a constant speed that matches your piping speed. A lot of people struggled with this, but somehow I was able to coordinate both my movements for this one. I did about three rows on top of each other, then finished off with some dots in the middle. I like doing this flower the most, and I think it turns out consistently well because there’s actually a lot of room to make mistakes and cover them up with new rows of petals. This Tuesday is the last class, and it’s a big cake design session. I have no idea what I want to do, but I’m sure I’ll figure it out between now and then!